We have been very pleased to welcome some new faces to the conservation studio over the past month – we now have two new conservation volunteers, Olivia and Collette, and our CRC Graduate Trainee, Alice, who have been spending one-day a week with us in conservation. They have all been doing a fantastic job with their current project of surface cleaning and re-housing a series of Library Correspondence, dating from the 1930-40s, from the University’s Archive Collection. You will be able to read more about their work and their own perspective on their time in the studio in an upcoming blog post. 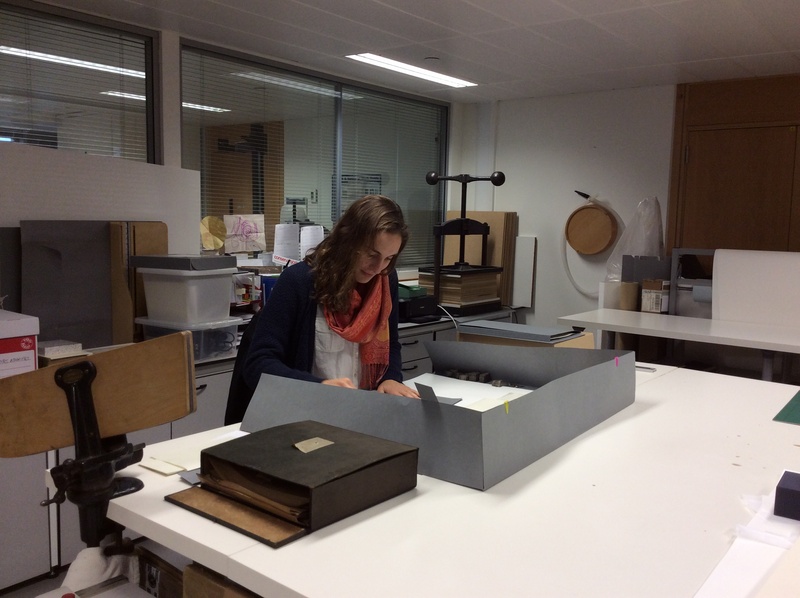 Our volunteer, Olivia, busy surface cleaning and rehousing the University’s Library Correspondence. We are excited to be able to add further to this bustle of activity – we are now advertising a 10-week conservation internship at the Centre for Research Collections. This is an exciting opportunity for a newly qualified, or soon-to-be qualified, paper conservator to further their experience in their chosen field, as well as gain wider experience of working in the Special Collections and higher education sectors. The successful intern with have the opportunity to work on the University of Edinburgh’s Thomson-Walker Collection; a collection of some 2500 prints bequeathed to the University by Sir John William Thomson-Walker (1871-1937), an eminent surgeon and print collector. This internship will see the prestigious print collection assessed for its conservation and storage requirements, with the first phase of appropriate treatment undertaken. This is a particularly exciting time for us in the studio, not only to have an important collection receive conservation attention, but to also to have the chance to pass on valuable experience and skills to those who are just beginning their conservation careers. If you wish to apply, please get your applications sent in by 28th November!